One of Swarm Technologies' pico satellites. The company wants to operate a constellation of 150 such tiny satellites for Internet of Things services. Palo Alto, California-based Swarm said Jan. 24 that it has raised more than $28 million in total since forming in 2017. The new Series A funds will go toward deploying the company's full constellation over the next 18 months, as well as adding new hires and boosting technology development. Swarm recently hired Kalpak Gude, a veteran satellite regulatory affairs expert, shortly after the startup was fined $900,000 by the U.S. Federal Communications Commission for launching four satellites on an Indian rocket last January without authorization. The company has since gone through the required regulatory processes for another three satellites, which launched in December aboard a SpaceX Falcon 9 rocket, growing Swarm's constellation to seven low-Earth-orbiting spacecraft. 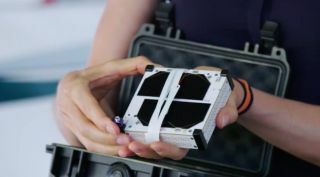 Swarm's satellites, each one-fourth the size of a single-unit cubesat, are designed to provide two-way communications for Internet-of-Things sensors and devices around the world. "With 75 billion connected devices coming online around the world over the next six years, viable and affordable network access will be essential," Sara Spangelo, Swarm co-founder and CEO, said in a statement. "For this reason, our technology has caught the attention of dozens of companies — from early-stage startups to Fortune 100 enterprises — with whom we have completed successful pilot tests in agriculture, maritime, ground transportation, and text messaging services." "Swarm has developed something entirely new: a low-bandwidth, latency-tolerant network that is extremely inexpensive, low-power and very easy to integrate for things that need to be connected anywhere in the world — and Swarm is doing it in a tenth the time of a traditional satellite network build," Dayton said.